Today I finished my very first afghan. It took me a year to complete and it is a type of chronicle for my growing crochet skills. I learned an incredible amount about working in the round and joining pieces! These lessons are now passed onto my students at Knit 1. (Interestingly, last Monday's beginning crochet class focused on working in the round and we made granny squares.) With this afghan, the most valuable working-in-the-round lesson I learned was the difference between working into the front of a stitch and working into the back. When working a project where you create ROWS, you are looking at the back of the stitches from the previous row. When working a project in the ROUND, you are looking at the front of the stitches from the previous row. In the picture below, item A is the back view and item B is the front view. Notice a difference? At the top of every crochet stitch is a "V". In item A, the back view, the "V" tip is to the left. In item B, the front view, the "V" tip is to the right. 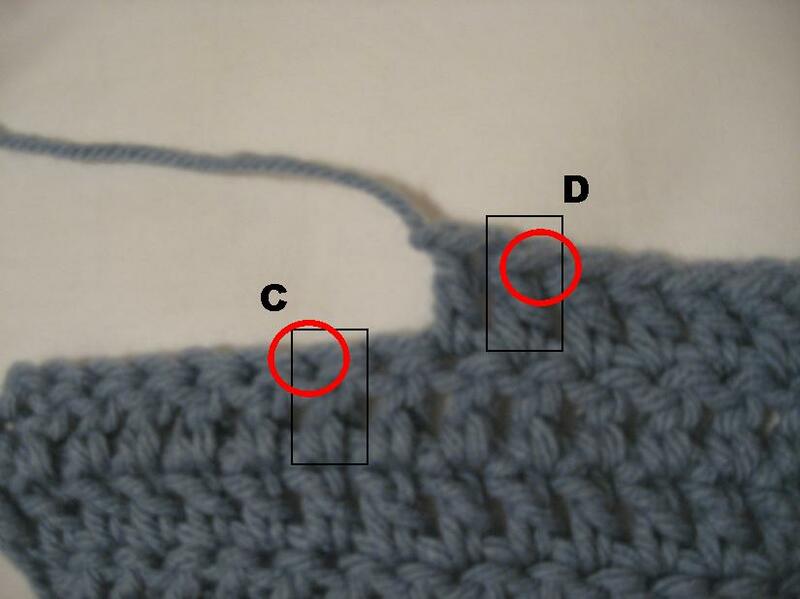 This is very significant for knowing where to place your hook to create your next stitch. In the picture below, item C shows where you would place your hook to create a stitch when working into the back and it is to the left. Item D shows where you would place your hook to create a stitch when working into the front and it is to the right. When you are working in the round and continue to place your hook to the left, as if creating rows, then your stitches will be off by one space. This one space may not sound like a lot, but in most patterns it will make a big difference.